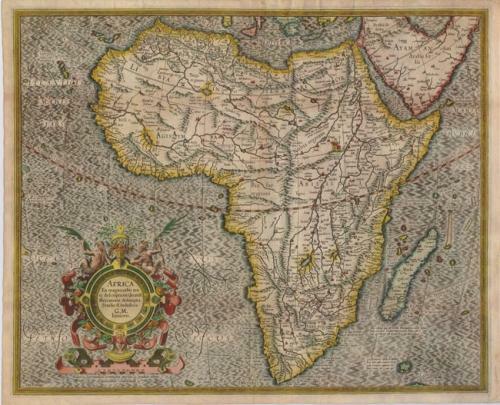 Title: 'Africa Ex magna orbis terre descriptione Gerardi Mercatoris desumpta, Studio & industria'. Compiled from Gerard Mercator's world map of 1569, this rendition was drawn by Mercator's grandson (also named Gerard) in 1595, and published later by Hondius. The map is typical of 16th century cartography with considerable fantastic detail in the interior. The depiction of the Nile is based on Ptolemy's geography with some complex modifications from various sources, including Abyssinian monks. The source of the Nile is shown as a series of lakes located in the Lune montes just north of the Tropic of Capricorn. Another branch of the Nile flows from the west, with this system rambling through what is the Sahara Desert. Mercator adds a lake named Sac. Haf lac, from the 1507 Waldseemuller world map. This lake feeds both the Zambere River and the Nile. In Abissini, the legendary Christian King Prester John sits on his throne. The boldly engraved oceans, beautiful calligraphy, and strapwork cartouche (surmounted by two satyrs) make this a decorative masterpiece. Uncommon blank verso. A nice impression on a sheet with old color. There are some repaired tears, including one extending 4" into the map from the top, ending just past the Tropic of Cancer, but nearly invisible in the image. A few very holes are only visible if held to the light. Adhesive remnants on verso. Ref: Betz #31; Norwich #21.